Losing your keys overboard can be a major inconvenience. But not if you’ve equipped them with their own personal emergency rescue gear! 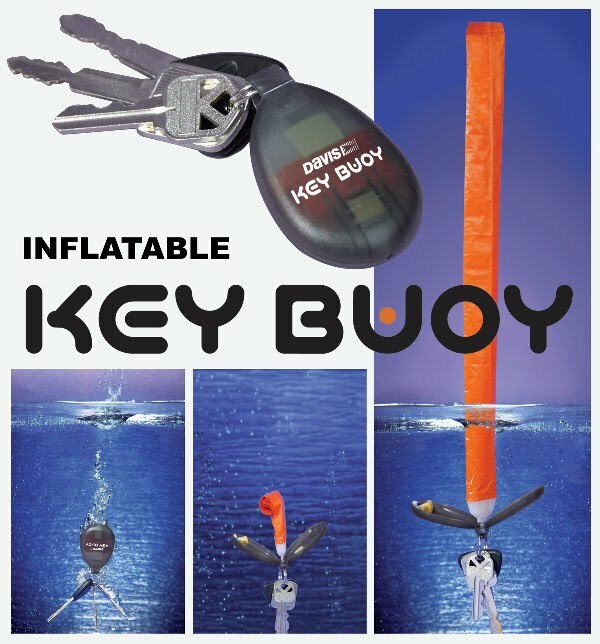 The new self-inflating key buoy from Davis Instruments provides a floating margin of safety for your precious keys. How does this nifty little, inexpensive ($7) doo-hickey work? PLUNK! OH, NOOOOOO! There go your keys. Straight to the bottom they go, potentially taking with them your means for getting home (car keys), getting inside your home (house keys), and who knows what else (secret lock box key?). Never fear. You’ve attached the self-inflating key buoy! As it sinks, water percolates inside the key buoy plastic, which then pops open to release a 14-inch-long orange air tube. The tube quickly inflates through a chemical reaction between sodium bicarbonate and tartaric acid, lifting your keys back to the surface for easy–and easily-spotted—retrieval. HOORAY! You can now get home and savor the contents of your secret lock box. 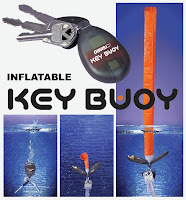 The self-inflating key buoy can lift up to 2.8 ounces and can rise back to the surface in as little as 60 seconds (longer for heavier key chains). Once activated, it stays afloat for an hour or so. Its size also makes it more manageable to keep in your pocket than other key-floating options like chunky foam attachments. They are single-use only. You can order it here.